Many of the prisoners who were ordered to surrender in Singapore on 15th February 1942 eventually found themselves on Formosa and working as slaves down copper mines. After the capitulation and a month spent in Changi Jail, a large number were moved, on the 13th March, to the River Valley Camp where they were held until October 1942. This whole camp was then cleared and the prisoners, mostly British, were taken to the docks to embark on a ship for Formosa - the "Dai Nichi Maru". On arrival they were taken to the Takao and from there the exhausted party of Pow's were taken to a camp called Taichu which up until that point had housed American prisoners. As the British were moved in, so the Americans were moved out and onto the now empty "Dai Nichi Maru" and shipped to Japan. It was widely felt that the Japanese wanted as many Americans as possible in Japan rather than in other areas, possibly for bartering purposes should the need arise. At Taichu camp the prisoners were engaged in a huge river reconstruction project and subjected to hours of hard labour in the hot tropical sun. Later in October another group of prisoners, estimated at around 1,000 were taken to the docks and embarked on another ship called the "England Maru". Over two weeks later on a cold wet day in November, they arrived in Formosa, at Keelung. 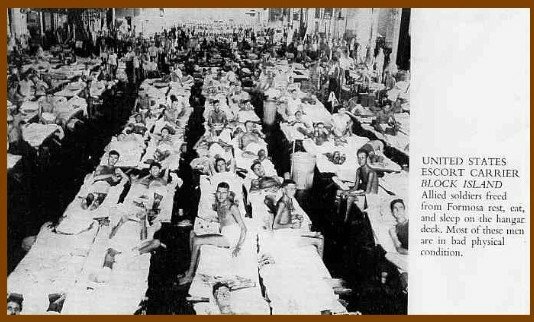 This party of exhausted POWs were split into two groups of about 500 prisoners in each group. One group was taken to a camp called Taihoku Camp 6, where they worked on a number of hard labour projects and the other party was sent to Kinkaseki - a base camp for the nearby infamous "copper mine camp" It was here, working underground, many for the remainder of their captivity, that the men slaved, almost naked and barefoot, for up to twelve hours a day in the grimiest of conditions and subjected to brutal treatment at the hands of their tormentors. Food and medicine were in short supply, as in other regions. Some prisoners found themselves in camps at Haito - a camp in Southern Formosa , where they spent long back breaking days, filling train loads of small stones to be used in constructing runways. They also slaved in the sugar-cane fields. Wherever they were, the prisoners on Formosa found the conditions deplorable: they were plagued with all types of insects - bugs, fleas and flies by the million that settled on what precious food they had spreading diseases by the minute. As well as the well known beriberi, malaria, dysentery, pellagra, there was the curse of catching worms. Rats, too, ran amok round the "hole in the floor" toilets and all over the ill patients, too weak to protest. Beatings from the guards were frequent and food and medicines, although available, were held back by the Japanese. Put together, the consequences of so many diseases, starvation, beatings and lack of hygiene, resulted in many deaths. As well as the permanent camps that served the copper mines, there were many transit camps which would house prisoners for a short period who were being shipped from Singapore to Japan. During the period that several "hell ships" were sunk while transporting prisoners from Singapore, many of those who survived the sinkings only to be picked up again by another Japanese boat, were taken to one of the transit camps on Formosa to await another ship to take them onto Japan. Relief finally came in 1945, with the dropping of the atomic bombs and the surrender of Japan. Shortly after, in September, the American aircraft carriers"Block Island" and the "Santee" arrived at the northern port of Keelung and took the surviving prisoners, approximately 1,200 of them, off their island prison and on to Manila in the Philippines and freedom. Where hero's graves with names thereon, Forever frown on me. Unafflicted, unoppressed, they sleep the blessed sleep. Disturb thou not the blessed sleep of Britain's glorious dead. Upon them thou has quickly seized, why hunger thou for more. To lay our comrades down to sleep within thy rugged breast.